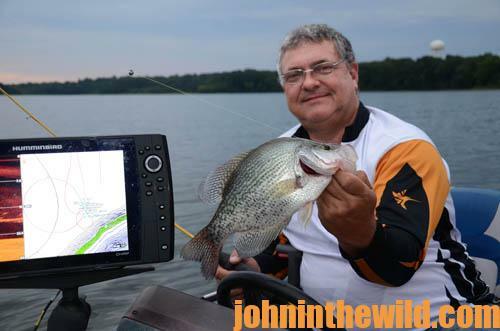 To learn more about fishing for crappie, visit http://johninthewild.com/books/#crappie. 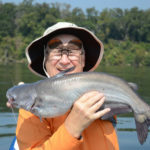 For a free copy of “The Crappie Catcher’s Cookbook,” visit http://johninthewild.com/free-books. 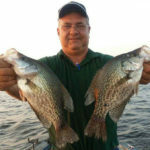 Tony Adams, a fishing guide on Lake Eufaula in Eufaula, Alabama, likes to catch big crappie. However, most fishermen have a difficult time determining how big a crappie is from a photograph. 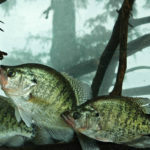 If an angler catches a 1-1/2 to 2-pound crappie and holds it out in front of himself for a photo, the crappie will look larger than it actually is, due to its being so close to the camera. But if the angler holds the crappie in close to himself, the crappie doesn’t look very big, no matter how big the fish actually is. Realizing this problem of determining the size of a crappie, Adams began to use the 5-gallon crappie system. 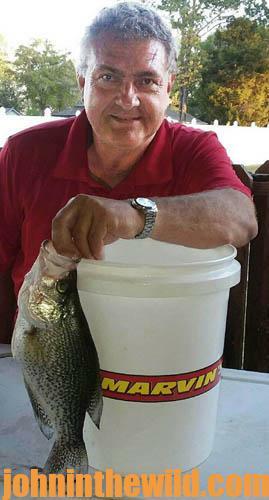 If you hold a crappie by the lips and put its tail at the bottom of a 5-gallon bucket and the mouth of the crappie is even with the top of the bucket or protrudes over the top of the bucket, then that’s a 5-gallon crappie. 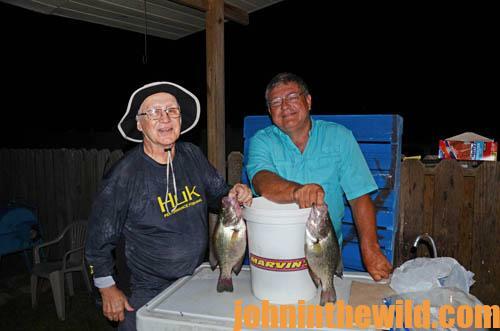 If you take a 5-gallon bucket and mark the line reaching the 4-gallon mark on the outside of the bucket, then when you hold your crappie beside the 5-gallon bucket with the fish’s tail on the bottom of the bucket, and the crappie’s lips are even with the 4-gallon mark, you’ve caught a 4-gallon crappie. Adams puts another mark on his bucket at the 3-gallon mark. 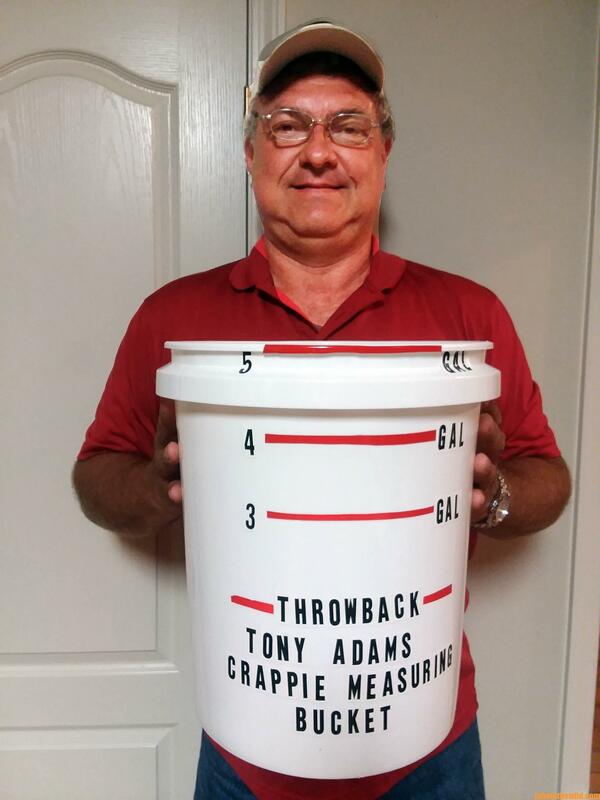 Any crappie that’s 3 gallons or less, Adams generally considers to be a throwback. 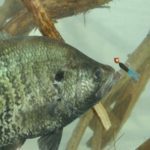 With this system, Adams is able to take pictures of his customers’ catches and have a better visual representation of how big the crappie is that the angler has caught. 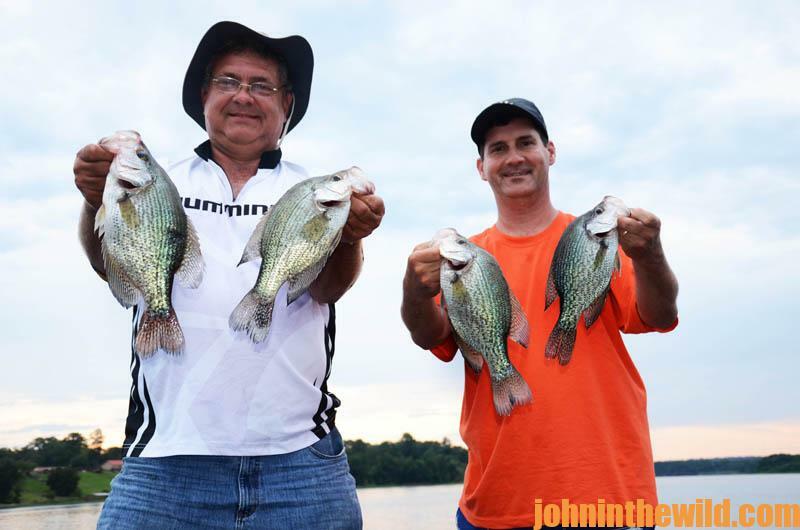 Generally, a 5-gallon crappie will weigh 2 pounds or more – a really fine, trophy crappie. 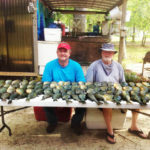 When I asked Adams what he has to do to catch the biggest crappie he can catch on every spot he fishes, he explains, “Most of the time the crappie holding on structure will bite first or within the first 15-20 crappie we land. 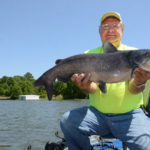 Then if we notice that the size of crappie we’re catching are not between a 4-5 gallon crappie, we realize we need to go to another spot to catch the bigger crappie. However, often my anglers will be having so much fun catching crappie they won’t want to leave the spot where we’re fishing. That’s fine too. I like to watch rods bend, drags slip, anglers have grins on their faces and the excited squeals and yells that youngsters make when they’re catching crappie and having fun. You can contact Tony Adams at 334-688-7505 or tony.adams@marvins.com. He also has a Facebook page at https://www.facebook.com/tony.adams.5477.